Debra Walters speaks clearly, her ability to recollect the past seemingly well-intact. A simple conversation with her wouldn’t likely lend anyone’s thoughts to the idea there was anything out of the ordinary. Perhaps that the biggest issue facing so many people in this world who are experiencing, maybe even unknowingly fighting internally, symptoms of early onset Alzheimer’s Disease. Walters works five days a week at Jo Ann’s Barber Shop, a true family-affair barber shop located on West William Street and owned by her aunt. But like the barber shop she works in, and as is often the case, Alzheimer’s, too, stays in the family. Her great-grandfather and grandmother both were stricken with the disease. At just 55 years old, Walters found out she, too, had the disease. Walters’ daughter, Nicole Brooks, said she began seeing signs before her mother became aware of a problem, as far back as three years ago. Issues like short-term memory loss and excessive repetitiveness gradually became worse, to the point Brooks urged her mother to seek medical attention. Admittedly, Walters said she was in denial at first, refusing to believe there was anything to be worried about. But those warning signs only continued to get worse until, eventually, they became undeniable. “I thought I was losing my mind,” she said, bluntly. The tipping point came one day when Walters was cutting the hair of a frequent customer. The man, Doug Scharre, had been getting his hair cut by Walters for 27 years. So, given the familiarity between the two, when she began asking him how he wanted his hair cut one day, Scharre began to see a significant issue at hand. Scharre, a neurologist at The Ohio State University Wexner Medical Center and professor of clinical neurology and psychiatry, requested that Walters come to see him down at the hospital soon. At the continued urging by her daughter, Walters went in for testing last year, which revealed the disease. While the initial diagnosis shook her, naturally, Walters said the medications that came with a proper diagnosis has made a world of difference in her thoughts. In a silver lining of sorts, and considering the state of disarray her thoughts were in prior to seeking help, the clarity the medication allows her has helped immensely. Perhaps more than anything, there was a freeing power in knowing what was going on inside her mind. In spite of the diagnosis, Walters continues to work five days a week at the shop. As Conner points out, she’s the only one who works five days a week there, indicative of the hard-worker she’s always been. Naturally, Brooks said her mother has her good days and her bad days. Conner added the bad days typically come when stress is involved. 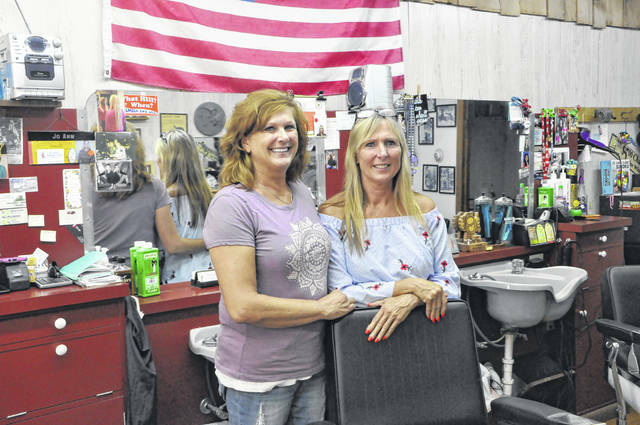 Fortunately for Walters, one of her best stress relievers is also where she spends a significant portion of her week, doing what she’s done for almost 30 years now — barbering. “Being in here, cutting hair, I’m always in my comfort zone,” Walters said. On Saturday, Walters, accompanied by several family members, will participate in Delaware’s Walk to End Alzheimer’s for the first time. The event currently has 322 participants and 49 teams signed up, and has already raised more than $56,000 for the Alzheimer’s Association. The event will feature so many people living with the disease and family members of those lost to the disease. But in addition to those people, Walters wonders about the people who don’t know, yet, what they are facing. Her message to them is simple: don’t wait to find out. The central Ohio chapter of the Alzheimer’s Association serves 14 counties, including Franklin, Union, Delaware, Marion and Morrow counties. In Delaware, the local office can be found in Andrews House, located at 39 W. Winter St., or reached at 740-363-1365. Also, the Alzheimer’s Association provides a 24/7 helpline that is operated by licensed social workers and clinicians right here in central Ohio from 9 a.m. to 5 p.m. each day. After hours, calls are directed to representatives at the national office in Chicago. Whether it be any type of crisis associated with the disease or simply a fundraising question, citizens can call 1-800-272-3900 at any time.